| Steel. A combination of natural elements and human processes. It can support thousands of pounds or simply hold together two pieces of paper. It all depends on how it is used, on who shapes it, on whose vision it is bent to represent. | For nearly twenty years, sculptor David Tonnesen of Somerville, Masschusetts, has used the man-made material to evoke the natural wonders from which it is born. 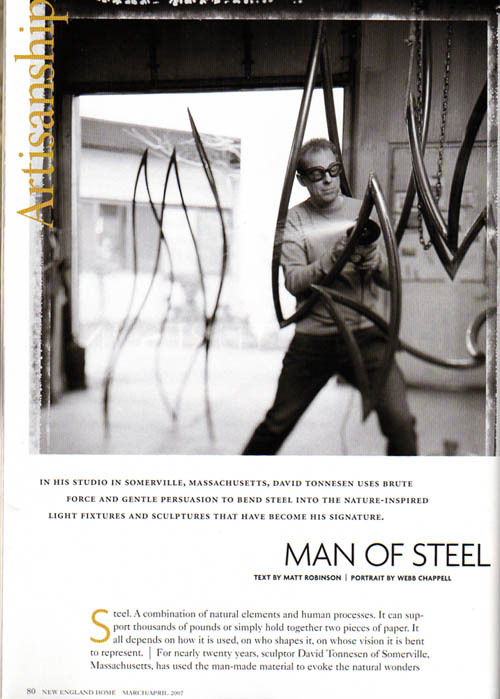 Taking a dark, heavy material, he blends artistic vision and practical application to bring light and openess to public and private spaces with his signature light fixtures and sculptures. (View the article with photos here or download PDF).